The boyhood of Davy has been sketched in some of the most fascinating pieces of biography ever written: the annals of science do not furnish us with any record that equals the school-days and self-education of the boy, Humphry, in popular interest; and, unlike many bright mornings, this commencement in a few years led to a brilliant meridian, and, by a succession of discoveries, accomplished more in relation to change of theory and extension of science, than in the most ardent and ambitious moments of youth he could either hope to effect or imagine possible. Humphry Davy was born at Penzance, in 1778; was a healthy, strong, and active child, and could speak fluently before he was two years old; copied engravings before he learned to write, and could recite part of the "Pilgrim's Progress" before he could well read it. At the age of five years, he could gain a good account of the contents of a book while turning over the leaves; and he retained this remarkable faculty through life. He excelled in telling stories to his playmates; loved fishing, and collecting, and painting birds and fishes; he had his own little garden; and recorded his impressions of romantic scenery in verse of no ordinary merit. To his self-education, however, he owed almost everything. He studied with intensity mathematics, metaphysics, and physiology; before he was nineteen he began to study chemistry, and in four months proposed a new hypothesis on heat and light, to which he won over the experienced Dr. Beddoes. With his associate, Gregory Watt (son of the celebrated James Watt) he collected specimens of rocks and minerals. He made considerable progress in medicine; he experimented zealously, especially on the effects of the gases in respiration; at the age of twenty-one he had breathed nitrous oxide, and nearly lost his life from breathing carburetted hydrogen. Next year he commenced the galvanic experiments which led to some of his greatest discoveries. In 1802 he began his brilliant scientific career at the Royal Institution, where he remained till 1812; here he constructed his great voltaic battery of 2,000 double plates of copper and zinc, and commenced the mineralogical collection now in the Museum. His lectures were often attended by one thousand persons: his youth, his simplicity, his natural eloquence, his chemical knowledge, his happy illustrations and well-conducted experiments, and the auspicious state of science, insured Davy great and instant success. The enthusiastic admiration with which he was hailed can hardly be imagined now. Not only men of the highest rank--men of science, men of letters, and men of trade--but women of fashion and blue-stockings, old and young, pressed into the theatre of the Institution to cover him with applause. His greatest labors were his discovery of the decomposition of the fixed alkalies, and the re-establishment of the simple nature of chlorine; his other researches were the investigation of astringent vegetables in connection with the art of tanning; the analysis of rocks and minerals in connection with geology; the comprehensive subject of agricultural chemistry; and galvanism and electro-chemical science. He was also an early, but unsuccessful, experimenter in the photographic art. Of the lazy conservative spirit and ludicrous indolence in science, which at this time attempted to hoodwink the public, a quaint instance is recorded of a worthy professor of chemistry at Aberdeen. He had allowed some years to pass since Davy's brilliant discovery of potassium and its congeneric metals, without a word about them in his lectures. At length the learned doctor was concussed by his colleagues on the subject, and he condescended to notice it. "Both potash and soda are now said to be metallic oxides," said he; "the oxides, in fact, of two metals, called potassium and sodium by the discoverer of them, one Davy, in London, a verra troublesome person in chemistry." Turn we, however, to the brightest event in our chemical philosopher's career. By his unrivalled series of practical discoveries, Davy acquired such a reputation for success among his countrymen, that his aid was invoked on every great occasion. The properties of fire-damp, or carburetted hydrogen, in coal-mines had already been ascertained by Dr. Henry. When this gas is mingled in certain proportions with atmospheric air, it forms a mixture which kindles upon the contact of a lighted candle, and often explodes with tremendous violence, killing the men and horses, and projecting much of the contents of the mine through the shafts or apertures like an enormous piece of artillery. At this time, a detonation of fire-damp occurred within a coal-mine in the north of England, so dreadful that it destroyed more than a hundred miners. A committee of the proprietors besought our chemist to provide a method of preparing for such tremendous visitations; and he did it. He tells us that he first turned his attention particularly to the subject in 1815; but he must have been prepared for it by the researches of his early years. Still, there appeared little hope of finding an efficacious remedy. The resources of modern mechanical science had been fully applied in ventilation. The comparative lightness of fire-damp was well understood; every precaution was taken to preserve the communications open; and the currents of air were promoted or occasioned, not only by furnaces, but likewise by air-pumps and steam apparatus. We may here mention that, for giving light to the coal-miner or pitman, where the fire-damp was apprehended, the primitive contrivance was a steel-mill, the light of which was produced by contact of a flint with the edge of a wheel kept in rapid motion. A "safety-lamp" had already, in 1813, been constructed by Dr. Clanny, the principle of which was forcing in air through water by bellows; but the machine was ponderous and complicated, and required a boy to work it. 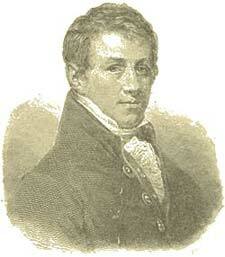 M. Humboldt had previously, in 1796, constructed a lamp for mines upon the same principle as that of Dr. Clanny. Davy, having conceived that flame and explosion may be regulated and arrested, began a minute chemical examination of fire-damp. He found that carburetted-hydrogen gas, even when mixed with fourteen times its bulk of atmospheric air, was still explosive. He ascertained that explosions of inflammable gases were incapable of being passed through long, narrow metallic tubes; and that this principle of security was still obtained by diminishing their length and diameter at the same time, and likewise diminishing their length and increasing their number, so that a great number of small apertures would not pass explosion when their depth was equal to their diameter. This fact led to trials upon sieves of wire-gauze; he found that if a piece of wire-gauze was held over the flame of a lamp, or coal-gas, it prevented the flame from passing; and he ascertained that a flame confined in a cylinder of very fine wire-gauze did not explode even in a mixture of oxygen and hydrogen, but that the gases burned in it with great vivacity. These experiments served as the basis of the safety-lamp. Sir Humphry Davy presented his first communication respecting his discovery of the safety-lamp to the Royal Society in 1815. This was followed by a series of papers, crowned by that read on January 11, 1816, when the principle of the safety-lamp was announced, and Sir Humphry presented to the society a model made by his own hands, which is to this day preserved in the collection of the Royal Society at Burlington House. There have been several modifications of the safety-lamp, and the merit of the discovery has been claimed by others, among whom was Mr. George Stephenson; but the question was set at rest in 1817 by an examination, attested by Sir Joseph Banks, P.R.S., Mr. Brande, Mr. Hatchett, and Dr. Wollaston, and awarding the independent merit to Davy. It should be explained that Stephenson's lamp was formed on the principle of admitting the fire-damp by narrow tubes, and "in such small detached portions that it would be consumed by combustion." The two lamps were doubtless distinct inventions; though Davy, in all justice, appears to be entitled to precedence, not only in point of date, but as regards the long chain of inductive reasoning concerning the nature of flame by which his result was arrived at. Meanwhile, the Report by the Parliamentary Committee "cannot admit that the experiments (made with the lamp) have any tendency to detract from the character of Sir Humphry Davy, or to disparage the fair value placed by himself upon his invention. The improvements are probably those which longer life and additional facts would have induced him to contemplate as desirable, and of which, had he not been the inventor, he might have become the patron." "I value it," Davy used to say, with the kindliest exultation, "more than anything I ever did; it was the result of a great deal of investigation and labor; but if my directions be attended to, it will save the lives of thousands of poor men." The principle of the invention may be thus summed up: In the safety-lamp, the mixture of the fire-damp and atmospheric air within the cage of wire-gauze explodes upon coming in contact with the flame; but the combustion cannot pass through the wire-gauze; and being there imprisoned, cannot impart to the explosive atmosphere of the mine any of its force. This effect has been attributed to the cooling influence of the metal; but, since the wires may be brought to a degree of heat but little below redness without igniting the fire-damp, this does not appear to be the cause. Professor Playfair has elegantly characterized the safety-lamp of Davy as a present from philosophy to the arts, a discovery in no degree the effect of accident or chance, but the result of patient and enlightened research, and strongly exemplifying the great use of an immediate and constant appeal to experiment. After characterizing the invention as the shutting-up in a net of the most slender texture of a most violent and irresistible force, and a power that in its tremendous effects seems to emulate the lightning and the earthquake, Professor Playfair thus concludes: "When to this we add the beneficial consequences, and the saving of the lives of men, and consider that the effects are to remain as long as coal continues to be dug from the bowels of the earth, it may be fairly said that there is hardly in the whole compass of art or science a single invention of which one would rather wish to be the author.... This," says Professor Playfair, "is exactly such a case as we should choose to place before Bacon, were he to revisit the earth; in order to give him, in a small compass, an idea of the advancement which philosophy has made since the time when he had pointed out to her the route which she ought to pursue." Honors were showered upon Davy. He received from the Royal Society the Copley, Royal, and Rumford Medals, and several times delivered the Bakerian Lecture. He also received Napoleon's prize for the advancement of galvanic researches from the French Institute. The invention of the safety-lamp brought him the public gratitude of the united colliers of Whitehaven, of the coal proprietors of the north of England, of the grand jury of Durham, of the Chamber of Commerce at Mons, of the coal-miners of Flanders, and, above all, of the coal-owners of the Wear and the Tyne, who presented him (it was his own choice) with a dinner-service of silver worth #2,500. On the same occasion, Alexander, the Emperor of all the Russias, sent him a vase, with a letter of commendation. In 1817, he was elected to the dignity of an associate of the Institute of France; next year, at the age of forty, he was created a baronet. Davy's discoveries form a remarkable epoch in the history of the Royal Society during the early part of this century; and from 1821 to 1829 almost every volume of the Transactions contains a communication by him. He was president of the Royal Society from 1820 to 1827. Fond of travel, geology, and sport, Davy visited, for the purpose of mineralogy and angling, almost every county of England and Wales. He was provided with a portable laboratory, that he might experiment when he chose, as well as fish and shoot. In 1827, upon resigning the presidency of the Royal Society, he retired to the continent; in 1829, at Geneva, his palsy-stricken body returned to the dust. They buried him at Geneva, where a simple monument stands at the head of the hospitable grave. There is a tablet to his memory in Westminster Abbey; there is a monument at Penzance; and his widow founded a memorial chemical prize in the University of Geneva. His public services of plate, his imperial vases, his foreign prizes, his royal medals, shall be handed down with triumph to his collateral posterity as trophies won from the depths of nescience; but his work, designed by his own genius, executed by his own hand, tracery and all, and every single stone signalized by his own private mark, indelible, characteristic, and inimitable--his work is the only record of his name. How deeply are its foundations rooted in space, and how lasting its materials for time!